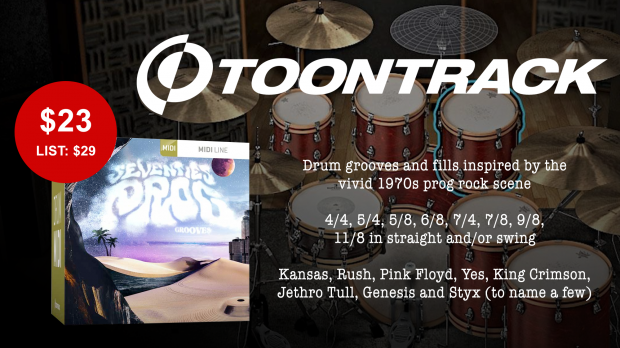 Toontrack today release Seventies Prog Grooves for their Superior and EZdrummer virtual instrument line. Available now for just $23 bucks, check it out ! Get Toontrack’s Seventies Prog Grooves Here ! By the end of the 1960s and continuing well into the late ’70s, bands like Emerson, Lake & Palmer, Kansas, Rush, Pink Floyd, Yes, King Crimson, Jethro Tull, Genesis and Styx were in the vanguard of a musical shift in rock. Suddenly, uncommon time signatures, long solos, technical passages, dragged-out instrumental parts and lyrical themes out of this world not only became common but largely accepted even on a commercial scale. In short: the prog rock scene that rose during this period applied extra everything – to everything. Maybe so the most in terms of drums. This entry was posted in DontCrack, Misc, Sounds and tagged 70's, Cymbals, Drums, EZdrummer 2, Gensis, Grooves, Hi Hat, Kansas City, Kick, MIDI, Pink Flyd, prog, Rock, Rush, Snare, Styx, Superior Drummer 3, Toms. Bookmark the permalink.